Breathtaking ocean views & a 189-ft continuous wraparound balcony highlight this 4BR/5½BA condominium in the premier The Oceanfront at Juno. The private foyer is magnificent with marble flooring and French doors. Wide & open with Saturnia floors & panoramic windows to enjoy the views. No expense has been spared, from marble-clad columns to automatic blinds. Centerpiece wet bar transitions the living and family rooms. A chef’s delight kitchen features granite, tumbled marble, storage, and top appliances including Bosch & Thermador. The split plan with each bedroom having its own bath lends privacy for all. The ocean bedroom can be a 2nd master. Huge master with tremendous closets & beautiful bath oasis. Hear the crashing of the waves. Watch the boat parades, sunrises & sunsets. Simply unforgettable! 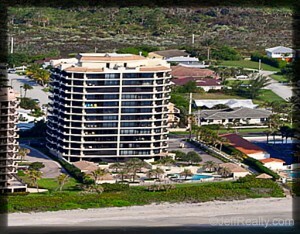 Posted in waterfront homes, waterfront homes for sale on December 29, 2010 at 2:00 am.